I would like to know if there is a way to unload plug-ins or prevent them from being loaded. Sometimes I’m working with more than one plug-in and I want to “disable” in order to use standard Visual Paradigm. If it is possible, I would develop a plug-in to manage the others, disabling them as I need. Sorry, unload (disable), or reload (enable) a plugin is not supported. And sorry, it is not in our plan. To disable a plugin, you may ‘uninstall’ the plugin manually (sorry, we does not support any UI to uninstall a plugin). 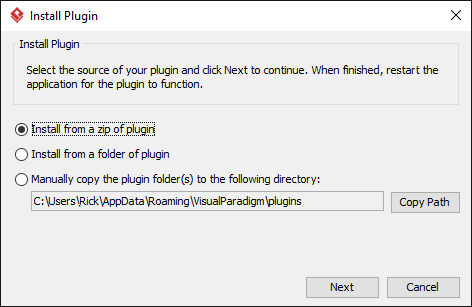 To uninstall a plugin, you need open the …/plugins folder, and remove the folder of your plugin, and restart VP is required. You may copy the path of plugin folder via Install Plugin UI.